Over 100 FHS students participated in the DECA District competition last week with 45 qualifying for the States in March at the Hynes Convention Center in Boston. You can help support the students for the State competition in March by contributing to the cause below. "Franklin’s DECA team competed in its annual District Competition Tuesday, January 8th and Wednesday, January 9th at the Mansfield Holiday Inn. DECA is Franklin High School’s “business” club. 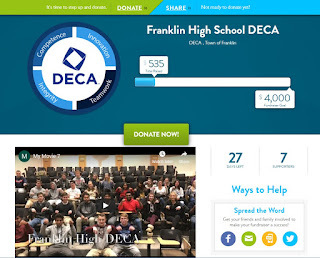 The organization itself “prepares emerging leaders and entrepreneurs for careers in marketing, finance, hospitality and management in high schools and colleges around the globe,” according to DECA’s website. It’s a great way to practice problem-solving and public speaking while having fun about a subject you’re interested in. At the competition, students are registered under different events, each one specialized to a specific type of business or business plan. If you’re into sports, there are sports marketing events. If you’re into international business, there is an international business event. DECA has something for everyone." Help support a student or two!